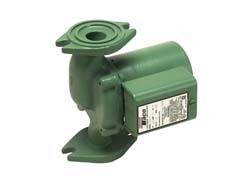 Taco Cast Iron Pumps Taco Pumps are designed for use in Hydronic and Radiant Heating Systems. The Cast Iron Taco Pumps are the signature green color. They include the IFC Pumps (Taco Pumps with Integral Flow Check). The Taco 007 Cast Iron Pump is our best selling pump. Taco Cast Iron Pumps should be used with the Cast Iron Pump Flanges. These flanges are sold in pairs, come in several different sizes, and should be selected based on the pipe size you are using. Replacement cartridges are made to replace the cartridges for Taco Pumps. These are a good option, however they are expensive relative to the cost of the pump, and often times not as readily available as the pumps themselves. The Taco Model 008 Cartridge Circulator is designed for a wide range of residential and light commercial, higher-head water circulating applications.